Heartwood is the inner core of the tree that becomes inactive or dies, gives the tree its strength and keeps the tree standing through all kinds of weather. People are like trees in many ways. We often have parts of ourselves that need to die off in order for us to flourish as intended. Crown consists of the leaves and branches at the top of a tree and plays an important role in filtering dust and other particles from the air. It also helps cool the air by providing shade. Like the crown of a tree, the human brain constantly filters information and tries to protect the inner self from overexposure to negative experiences. Trunk and Stem supports the crown and gives the tree its shape and strength. Our physical bodies are our trunk. We need to be mindful of our body and honor it as a temple. When we overlook proper physical, spiritual and mental care, we become unsteady without balance and our trunk becomes weak. Sapwood is the youngest layer of wood that becomes heartwood as it dies off. This can represent our inner child within the adult that makes us who we are and it often gets covered up layer by layer. 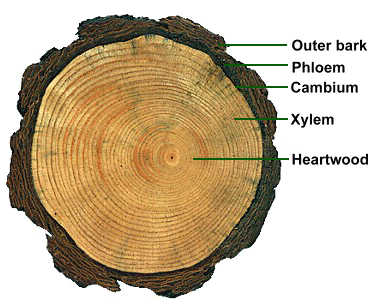 Cambium is the very thin layer of growing tissue that is visible in the form of the growth ring that is added each year. This is what makes the trunk, branches and roots grow in diameter and become stronger and more stable. For a person, this represents self awareness, knowledge and the process of assimilating truth about oneself enabling growth experience by experience. Bark covers the trunk, branches and twigs of the tree. The outer bark acts as a suit of armor against the world by protecting the tree from insects, disease, storms and extreme temperatures. We all do things to protect ourselves and create bark or walls so as to not get hurt. While sometimes this is needed for survival, at other times it stops us from living fully. Roots absorb water and nutrients from the soil, store sugar and anchor the tree upright in the ground. A person can have strong family roots with a deep foundation building character, values, morals and ethics; or a person can have shallow roots depending on life's circumstances that any turmoil or trauma can uproot them and knock them to the ground. At Heartwood Counseling, we will work together to help you reconnect to all of your inner resources and strengths in order to experience life more fully!